Dr. Shaha is an Attending Surgeon on the Head and Neck Service at Memorial Sloan-Kettering Cancer Center and Professor of Surgery at Cornell University Medical College, New York. Dr. Shaha completed his surgical training at M.S. University of Baroda, India and worked as a House Surgeon at Tata Memorial Hospital, where he developed an interest in head and neck surgical oncology. After his arrival at Memorial Sloan-Kettering Cancer Center in 1975, Dr. Shaha did a surgical oncology fellowship and subsequently completed his surgical training at Downstate Medical Center in Brooklyn, New York. Dr. Shaha returned to Memorial Hospital in 1981 as a Fellow in Head and Neck Surgery. He joined the Department of Surgery at Downstate Medical Center in 1982 as a Head and Neck Surgeon, rising to the rank of Professor of Surgery in 1992. During this period, he was also Chief of Head and Neck Surgery at King’s County, Brooklyn VA Hospital and University Hospital. From 1987 to 1989, Dr. Shaha spent two years as Acting Chief of Surgery at Brooklyn VA Medical Center. In August of 1993, Dr. Shaha moved to Memorial Sloan-Kettering Cancer Center as an Attending Surgeon on the Head and Neck Service. During his post-graduate training, Dr. Shaha secured several gold medals and was given the Golden Apple Teaching Award at Downstate Medical Center. 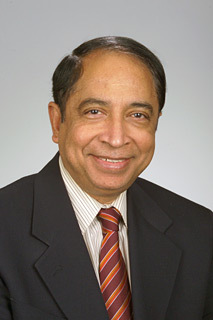 Other awards Dr. Shaha received include: Faculty Member of the AOA Honor Medical Society, the Outstanding Teacher Award at Memorial Sloan-Kettering Cancer Center in 1996, the Honor Award from the American Academy of Otolaryngology/Head and Neck Surgery, and he was named Visiting Professor of the Society of Head and Neck Surgeons in 1997 and 1998. He has been honored by visiting professorships at University of Santa Tomas, Manila, and Sun Yat-Sen University Guang zhou, China. Dr. Shaha has been actively involved in local and national head and neck societies, as well as having been President of the New York Head and Neck Society, the American Society for Surgeons of Indian Origin, and the Brooklyn Surgical Society. He was Co-President of the American Head and Neck Society, 1998-1999, and was President of the New York Cancer Society, 1999-2000 and President of the New York Surgical Society, 2004-2005. He is a member of many scientific organizations and serves on the editorial board of the Journal of Surgical Oncology, Head and Neck, Annals of Surgical Oncology, Brazilian Journal of Surgery, and Journal of Clinical Oncology. He is an honorary member of the Brazilian College of Surgeons, the Cuban Surgical Society, Association of Surgeons of India, the Korean Head and Neck Society, Latin Head and Neck Society, Panamanian Society of Oncology, Chilean College of Surgeons, and Costa Rican Endocrine Society. He has been a visiting professor at many universities throughout the United States, as well as a guest speaker in many South American, Asian and European countries. He was the Program Chairman for the Fifth International Head and Neck Oncology Meeting in San Francisco (2000) and served as the Conference Chairman for the Sixth International Head and Neck Meeting in 2004. Recently Dr. Shaha was the recipient of the Distinguished Service Award by the American Academy of Otolaryngology – Head and Neck Surgery and was also vice-president of the American Association of Endocrine Surgeons. Recently he was elected to the American Surgical Association. Dr. Shaha has been academically active at national and international meetings, with approximately 440 papers, 300 of which are peer-reviewed. His Curriculum Vitae includes 140 published abstracts, 58 posters and 45 scientific exhibits presented. His research interests include tracheal reconstruction and an experimental model of tracheomalacia and thyroid cancer. Dr. Shaha has dedicated his professional career to the training of medical students and residents and has developed a preceptorship program at Cornell University Medical College in head and neck training for medical students. He is Chairman of the Advanced Training Council for Head and Neck Oncology Fellowships in the USA.